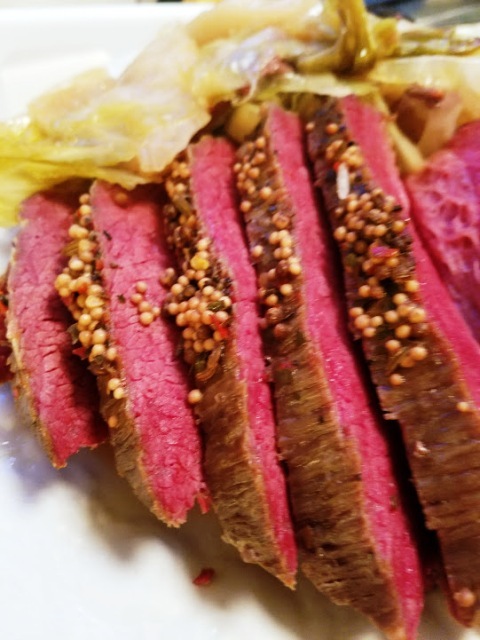 Every year I make hubs Corned Beef and Cabbage and every year I ask myself why I don’t make it more often, the corned beef always gets gobbled up so quickly, so I go out to the market and buy another corned beef. 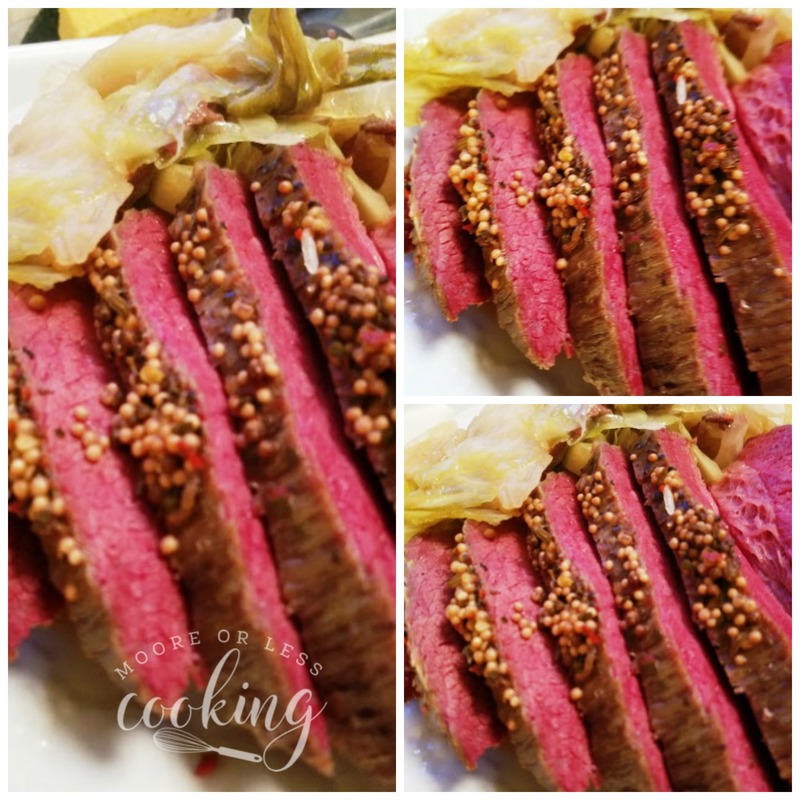 This year, I decided to bake my Corned Beef and Cabbage, except lo and behold, we didn’t buy any cabbage…gasp…So I baked the Corned Beef with potatoes and carrots and hubs went to the market to get a head of cabbage. After everything was nicely baked, I placed all the ingredients in a crock pot, but the cabbage wasn’t cooking quick enough for me, so I placed it all in the oven, oh my my! Hubs said this was THE BEST CORNED BEEF!! Wow after 20 years of making this meal, I will be changing to baked only. The Corned Beef didn’t come with a seasoned packet so I made my own seasoning. Perfection! Unwrap the brisket and place it fat side up inside the baking dish. If it came with a spice packet, sprinkle it over the top, then sprinkle on the black peppercorns and minced garlic and rub it in. Cover the dish with a lid or heavy aluminum foil and place it in the oven for 2½ hours-3½ hours.. Check the brisket by inserting a fork in the meat. If it goes in easily, it’s ready; if it meets with resistance, bake for another 30 minutes---or up to an hour in some cases! If the brisket is tough, it hasn't cooked long enough! 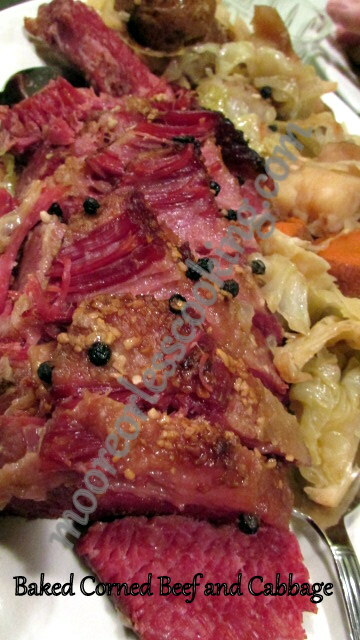 Slice Corned beef into good sized slices, serve veggies along side. Have a Guinness Beer or two with this delicious meal. Happy St.Patrick’s Day from the Moore Family! Looks great..where I live in Newfoundland Canada, this is for dinner every Sunday, with either pork, turkey, roast of beef, chicken.p..our salt beef is not brisket…it is beef from the cow and soaked in salted water. We soak it in water overnight and change the water at least 6 times before it is cooked. Along with this we have peas pudding put in a bag, something like burlap, but not,that is all put in with the veggies and salted beef, or we make a blueberry or raisin duff instead of the peas pudding…a weekly tradition..yummy!!! Thank You Nettie…you are welcome anytime!! !….All the Best and tomorrow have a happy St. Patrick’s Day….holiday here..great times.. The checkout lady and I were just talking this morning about why we only buy corned beef once a year since it is so tasty and pretty easy to make. I typically boil mine for a few hours and then finish it off under the broiler with a mustard/brown sugar glaze. I love that little bit of crispiness added! Thanks so much for sharing with us at Encouraging Hearts and Home. Pinned. Your Corned Beef and Cabbage looks delicious! Thanks so much for sharing your post with us for our special St. Patrick’s Day Full Plate Thursday! Have a great week and come back soon.